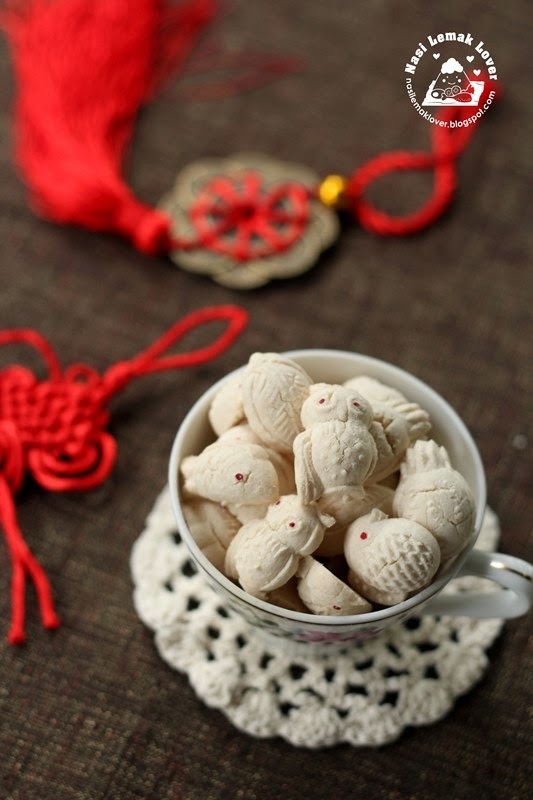 Kuih Bangkit (or tapioca biscuits) is one of my family favourite's CNY cookie. Earlier I have hard time to remove the kuih from the traditional wooden mould. But not for this year, I have found the solution and it was a breeze to make Kuih Bangkit using wooden mould this time. I like Owl shape the most! what about you? and I like their shape, very tiny ! In my old recipe, I forgot to mention that to use fresh concentrated coconut milk. Every year, I have to get my husband to squeeze coconut milk from fresh grated coconut by not adding any water. By using concentrated coconut milk, this Kuih Bangkit is full of coconut aromatic, crunchy and melt in your mouth once it hit your salivate! I found out that the dough has to be on dry side, then only easy to remove from wooden mould (So this biscuit will have some crack after baked) I have record a video, you may check out. Please adjust the amount of coconut milk used in this recipe, it is depend the dryness of your flour and thickness of the fresh coconut milk you used (if you use store bought or can coconut milk, they have difference texture)..
Stir fry tapioca flour and sago flour with pandan leaves in a clean wok for 45mins over low heat until flour very light and slightly turned yellow. When you see pandan leaves turned dry, remove from the flour, otherwise it will break into small pieces, it is hard to remove later (otherwise sieve the flours once cooked). Whisk egg yolk until creamy, add in icing sugar and half coconut milk, whisk till combine. 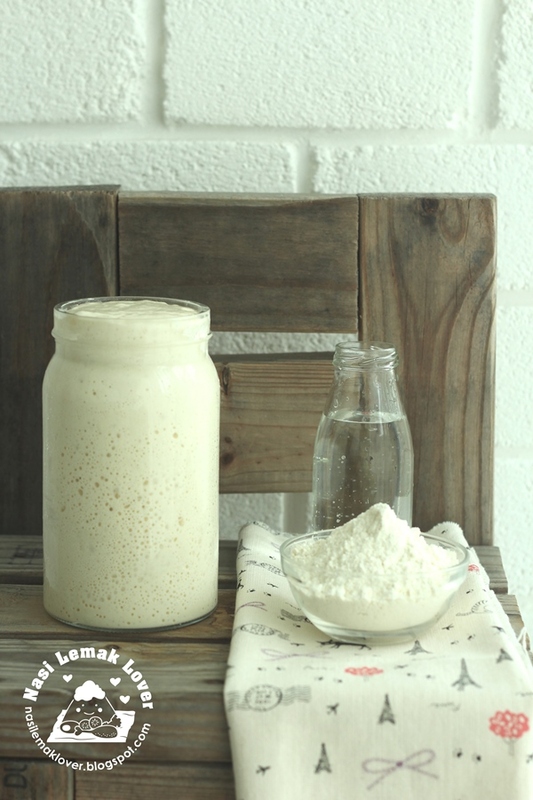 Add in cooked flour, slowly add in the balance coconut milk (little by little) into mixture, mixing by hand till mixture clings together to form a dough (the dough is slightly dry). Dust a wooden Kuih Bangkit mould with extra cooked flour, press dough hard into the mould. Trim excess dough. Tap gently on hard surface to remove the kuih. Repeat. Set aside extra coconut milk to add in dough when dough turned too dry. 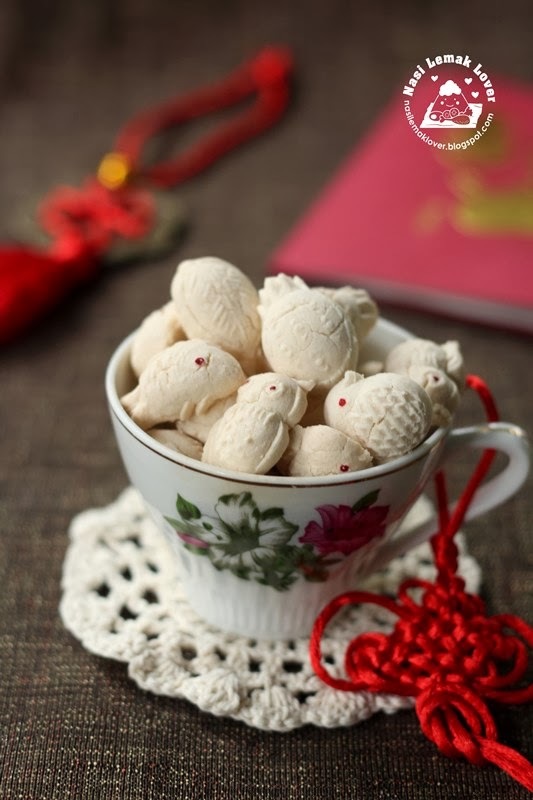 I am linking this post to Bake Along event, Chinese New Year Cookies for the month of Jan 2014 organised by Lena of Frozen Wing, Zoe of Bake for Happy Kids and Joyce of Kitchen Flavours. Sonia I love your kuih Bangkit mould, they are so pretty. Lucky you, you have a strong man to help you squeeze the coconut cream. I thought you wont be posting your kuih bangkit but am I glad when I see this..... you know which animal I like most as they are indeed so cute and pretty. Yes, I agree with Veronica....lucky you to have your strong man to help you out. well done! i like the owl shape too. never see the owl shape before. i believe this cookies smell so good with pure coconut milk. love it! I am glad to see your post here,it's my first time making kuih bangkit and two batches I made also failed ,maybe I didn't get the dough texture right, your dough looks crumbly and easy to knock out from the mould. Your mould is very unique and beautiful too, especially the owl. Where do you buy this mould? Kuih bangkit is also one of my fav. new year cookies. I like to owls they are cute. 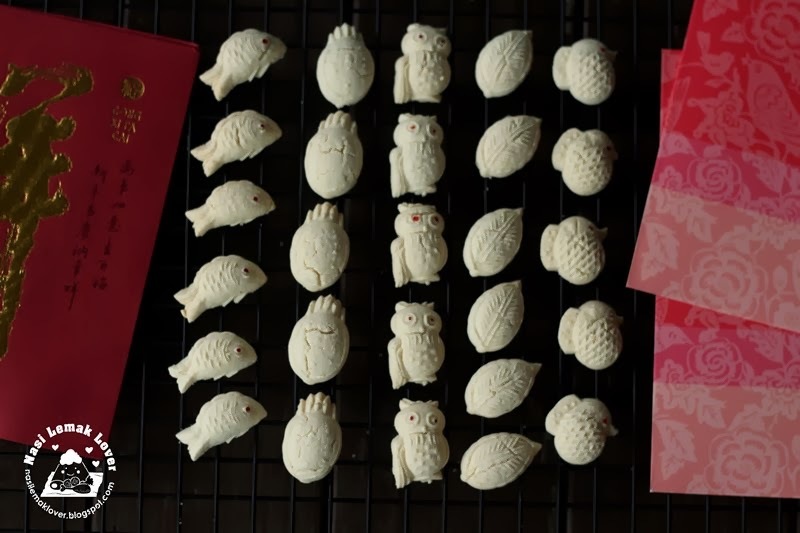 Kuih Bangkit sound not easy to make, yours one look so lovely, I especially like the owl, it looks adorable with its little red eyes!! Wah, lucky to know this solution. by the way, my sis try to figure out one of these shape, whether it is a shell or sea-horse..
Definitely worth all the efforts! They look sensational. So cute and delicious looking biscuits.Excellent preparation. Sonia, I like the fish and the owl! they are so cute! The way you described the cookies make me miss kuih bangkih! These cookies look so adorable..lovely clicks as usual. I had this problem when I made my kueh bangkit! Your video is brilliant!!! Thanks for your "enlightenment"! Sonia, I love the owl shape too, looks so so cute! Hi Sonia, my hubby did the difficult kneading. Thanks for confirming that the dough must be dry [that's why it is crumbly at the beginning] to get melt in mouth KB. A couple of questions. What is sago flour and why did you need to use two type of flours for this cookies? Hi Sonia, thank you for sharing this recipe. I tried baking today with Ayam brand coconut cream. It turn out really well despite this is my 1st attempt. The mould is so cute! Love this cookie. anonymous, I learnt to mix sago flour with tapioca flour from the owner of bakery shop who said it taste nicer and a lot of peoples are doing this way. Kuih bangkit is a favourite for most of us. The owl shape is really cute! Thanks for sharing and linking with Bake-Along! Hi Sonia! 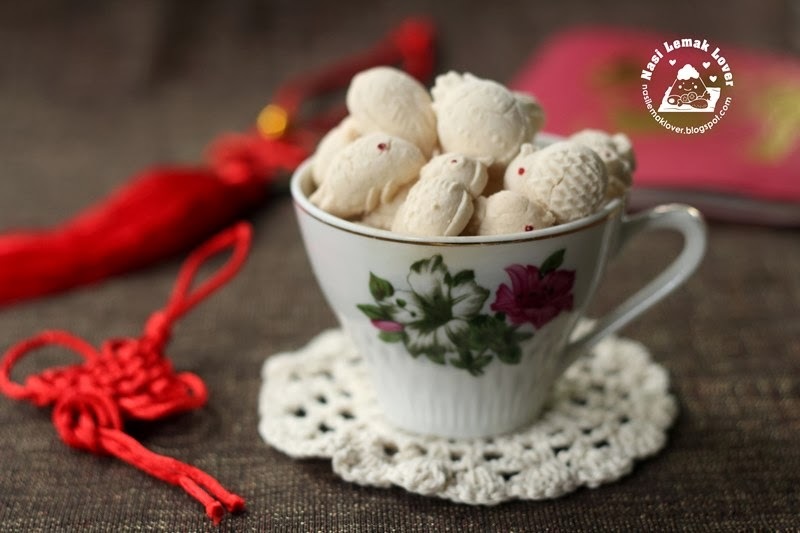 You've been SUPER busy with baking and getting ready for CNY! Sorry I haven't been here for a while (reading your newsletter on iphone most of the time lately). I enjoyed your video! The owl shape is super adorable and I love the mold! 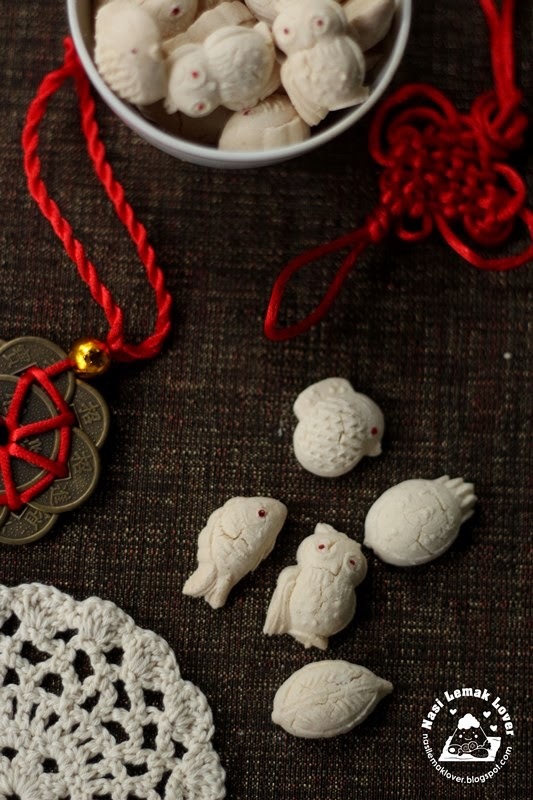 Looks like you've been extremely busy preparing the CNY cookies. This year I've no mood to start up anything. Wish I can try making this one day. Sounds pretty easy. Hi Sonia, is it necessary to cool flour for 3 days? what if I let it to sit for just a day? pls advice, thanks. Jermine, yes you have to, because the flour need several days to cool it down completely. If you try, you can check the next 1-2days, you still feel warm when you touch the flour. Hi Sonia, I enjoy your blog. 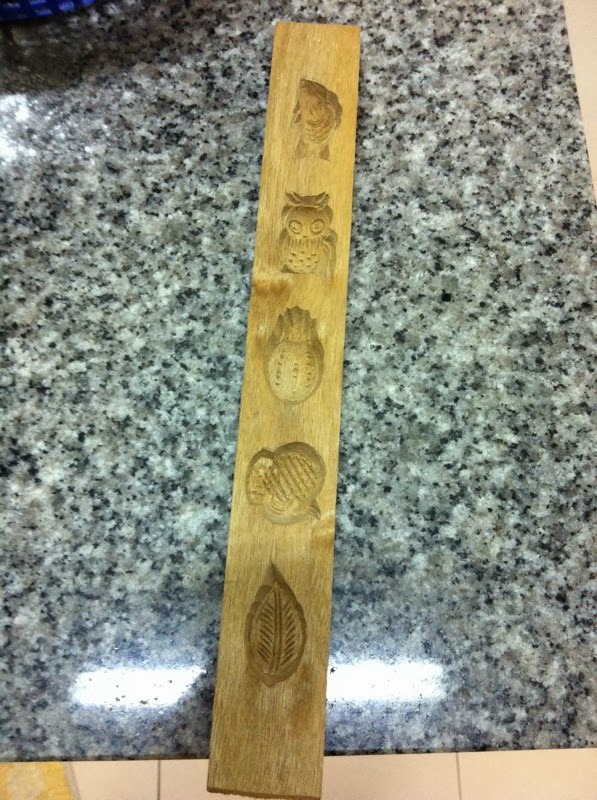 I love your mould especially the Owl :). Is it possible to buy this mould online or at local shops? Please advise which shops I could purchase the Kueh Bangkit and Dragon Mooncake moulds you have. Thanks! Hi Sonia, do u have any idea why my bangkit puffed up? I tried twice and both times also the same. First time used can coconut cream and second time used freshly squeezed coconut milk. Is it because I whisked the egg yolk too long? They melt in the mouth though. t3ng3ng, it shouldn't puff up too much actually since there is no rising agent added, ya probably you beaten egg yolk too long. Try baking this bake din melt in the mouth not sure which part went wrong so sad. I've came across a few recipe that bakes the flour instead of stir frying them in a wok. Is it possible to do that too for your recipe? Kaihui, yes you can, but I prefer this old method which you can really dry up probably the flour and resulted light texture of kuih . Thanks for the prompt reply! I can't wait to try it out. But may I know how many days can I store before it turns bad? I've tried yr pineapple tart recipe. And it taste really good as I expected. I'll try this next cny! Thanks for yr recipe ^.^ hope to see more recipes from yr blog!